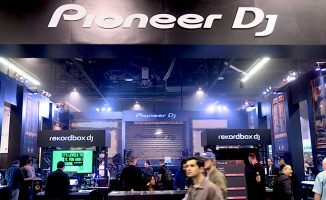 In this week’s article, we walk you through your first day with Serato DJ; getting it installed on your computer, hooking up your controller, and getting your music onto it. In this week’s instalment of our ongoing “Your First Day With…” series, we get our hands dirty with Serato DJ. 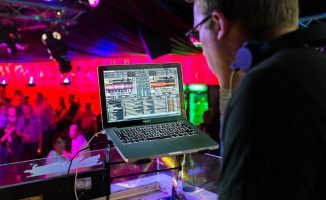 As in the previous article for Virtual DJ 8, we show you how to get the software up and running on your computer, how to get your music library onto it, and how to hook up your controller so you can get on with DJing! 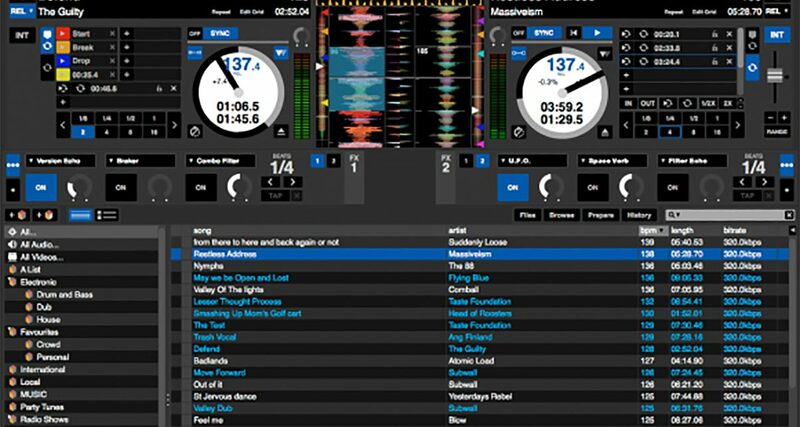 Serato is known to be one of the simpler DJ apps to set-up, but it still has some idiosyncrasies all its own, so if you’re still unsure of how to make it work on your system or if it’ll work with your controller, then this article is for you. Serato DJ is the company’s flagship software. Serato DJ is the company’s current flagship software. It’s what replaced the aging Serato Scratch Live (more on that later), and can also be considered as the “full version” of Serato DJ Intro. This is the software that comes bundled with mid to high-end controllers like the Pioneer DDJ-SX/SR/SZ, the Numark NS7II, and the Reloop Terminal Mix 8. To see the full list of controllers compatible with Serato DJ, click here. 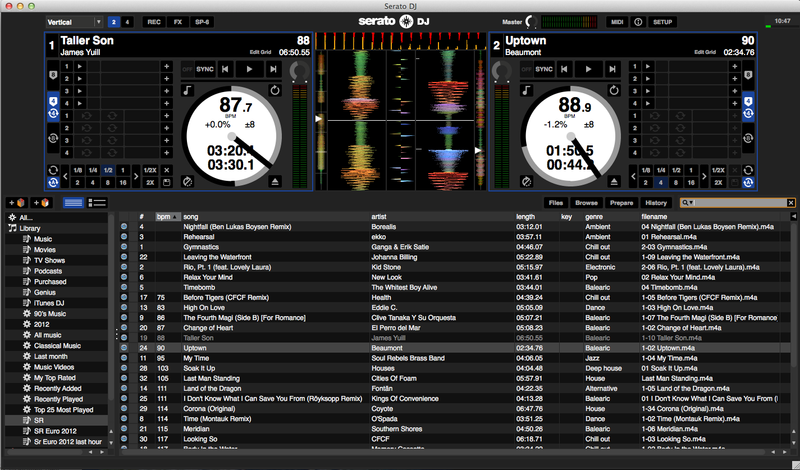 Serato DJ Intro is the “lite” version of Serato DJ. You can upgrade to the full version, which I highly recommend. 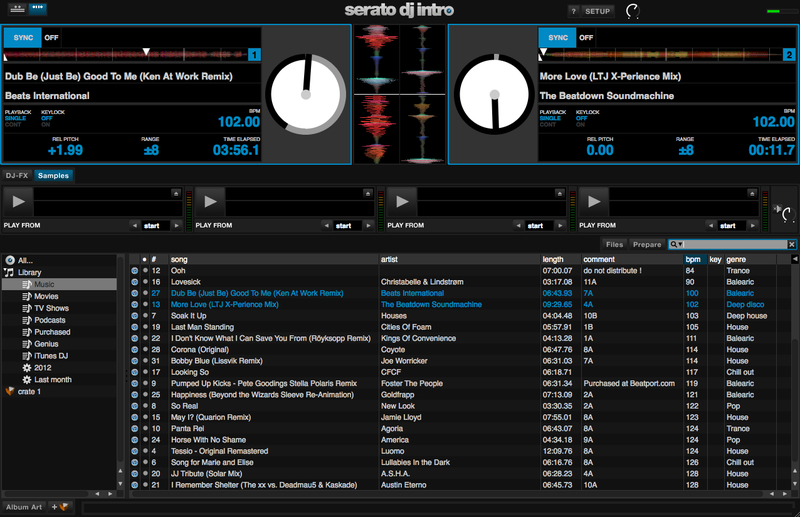 Serato DJ Intro is the “lite” version of the company’s flagship software. 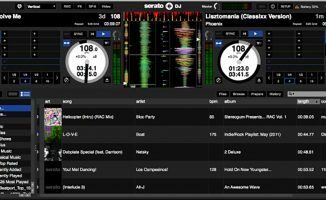 It lets you use many of Serato DJ’s features, albeit in a less feature-laden, stripped down fashion. It’s usually bundled with less expensive controllers such as the Pioneer DDJ-SB, Numark Mixtrack Edge, and the Reloop Beatmix 4. To see the full list of controllers that are compatible with Serato DJ Intro, click here. 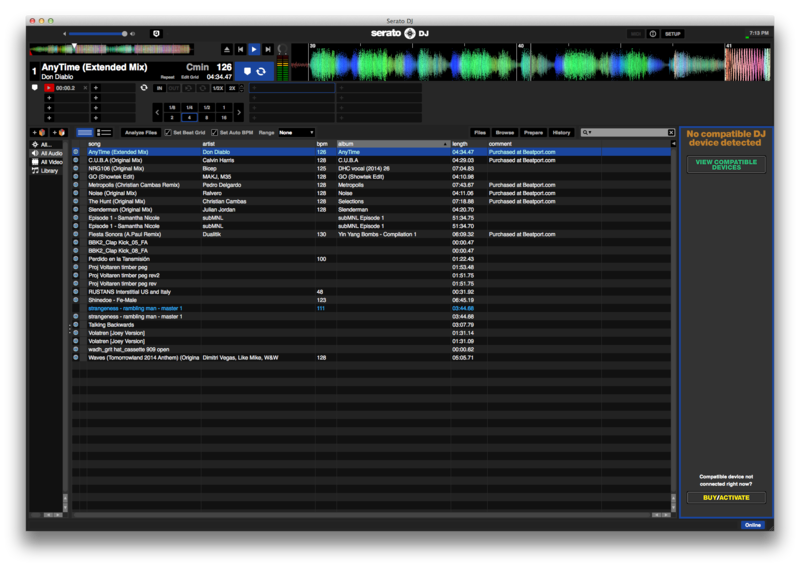 Do note that you can upgrade to the full version of Serato DJ, which I totally recommend. 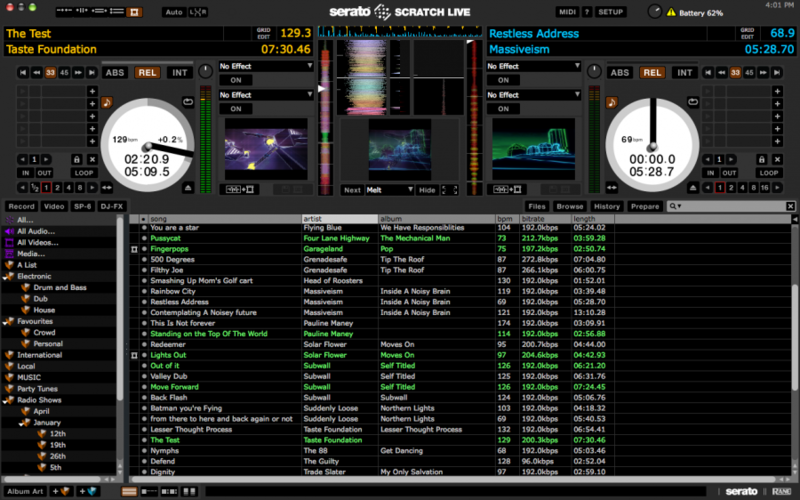 Serato Scratch Live is the company’s former flagship software. I also recommend upgrading to Serato DJ as Scratch Live will be discontinued in 2015. Oh, and it’s a free upgrade, too! Serato Scratch Live was formerly the company’s flagship software for DVS (digital vinyl system) users. 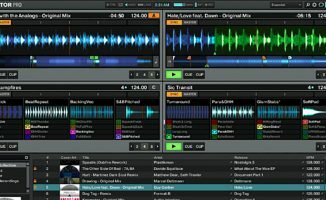 It has since been replaced by Serato DJ, which is now for all users. Sale of this software has been discontinued, and official support for it will cease after 2015. If you’re using Serato Scratch Live at the moment, you can upgrade to Serato DJ for free, provided the hardware you’re using is compatible with Serato DJ. If you want to know about the differences between Serato Scratch live and Serato DJ, click here. For Mac users, just double click on the installer file. A new window pops up with the Serato DJ/Intro icon, which you just drag to the Applications folder beside it. Done! 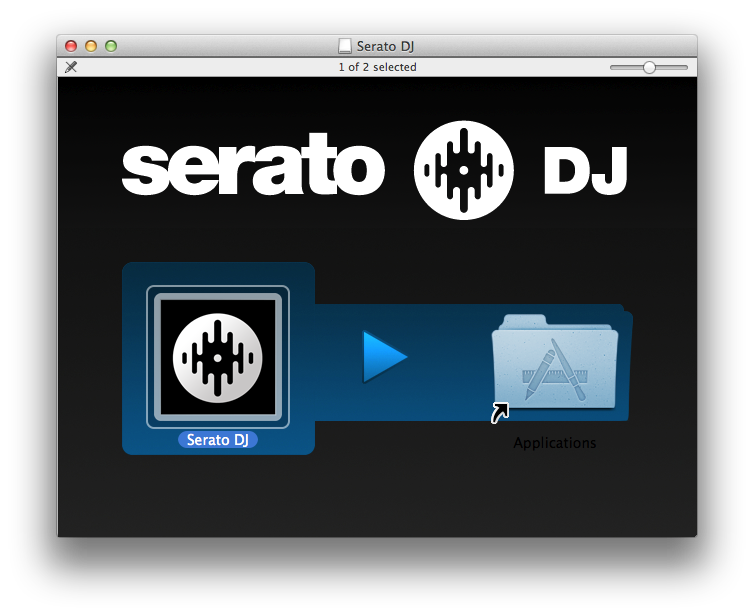 Getting Serato DJ installed on your computer is a straightforward procedure: On a Mac, just drag the Serato DJ icon over to the Applications folder. For the rest of this article, I’ll be referring to both Serato DJ and Serato DJ Intro as “Serato DJ”. Unlike other DJ software that can run standalone, you need to connect your DJ controller in order to mix properly with Serato DJ. To be able to mix with Serato DJ, you need to connect your DJ controller when using it. Although it’s possible to use the app without a compatible device connected, you’ll only be able to play one track at a time, and the interface looks a little bit different from the usual Serato DJ interface. This is meant more for library organisation, playlist creation, and track preview instead of an actual DJ performance. Create a My Serato account to activate Serato DJ on your computer and to gain access to add-on packs sold by Serato online. 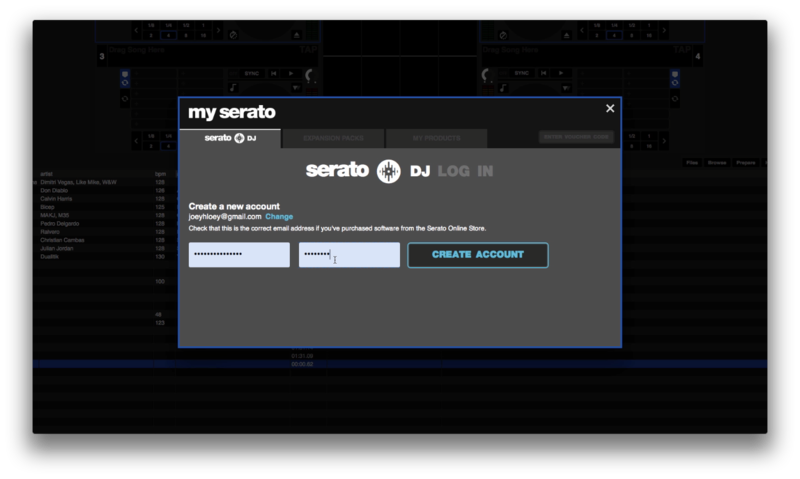 Now that you have the software installed and your controller hooked up, create a My Serato account so you can activate your software as well as any plugins and add-ons that may be available to you. Launch Serato DJ by double clicking on its icon on your desktop. If you’re on a Mac, you can find the icon in the Applications folder. Once the app has launched, click on the “Buy/Activate” button on the lower right side of the screen. Enter your e-mail address and click Continue. You’ll then be asked for a password, so go ahead and fill that out and submit. Click on the “Activate” button to activate Serato DJ on your computer. You can check if you have add-ons available to you by clicking the “Expansion Packs” tab, where you can activate them. You can also purchase packs here, such as extra FX. Do note that this isn’t available to you if you’re using Serato DJ Intro. 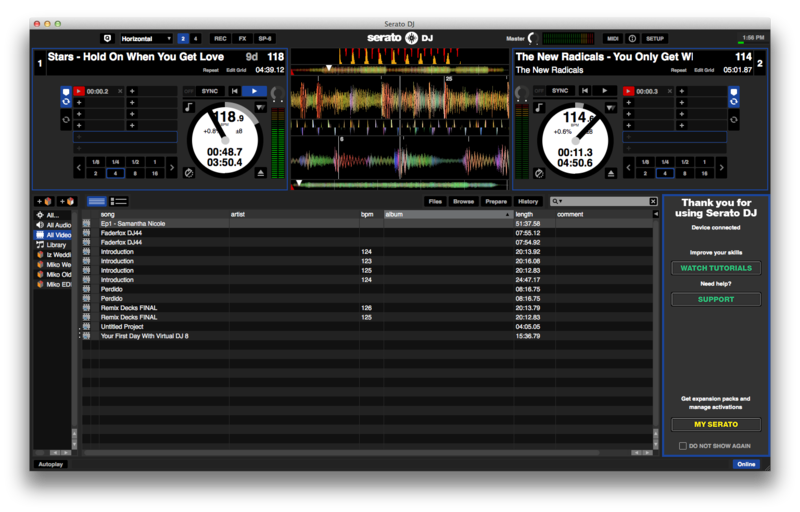 One of the things that DJs love about Serato DJ is that getting it up and running takes a minimum of fuss. If you see some tracks in your library, go ahead and drag them onto one of the virtual decks and press the play button on your controller. You can probably hear something by now (remember to set your crossfader in the middle and your volume faders up! ), but it’s also important to make sure that your music library is properly set-up and recognised within Serato DJ. Let’s get your songs loaded onto Serato DJ. As in the Virtual DJ 8 article, there are three ways to do this: You can drag and drop from within Serato DJ’s browser, from the iTunes tree within Serato DJ, or by dragging a song from the Finder window (Mac) or Windows Explorer (PC). Without a compatible DJ controller connected, this is what Serato DJ’s interface looks like. You can’t mix with two decks here, but this is where you can analyse all the songs in your music library. I suggest analysing tracks in your library so that Serato DJ can set beat grids, determine BPM, and assign other attributes to your songs ahead of time. While on-the-fly analysis during DJ sets don’t really take up much system resource, doing all of this before you take to the stage is a crucial part of preparation and can certainly help in a pinch when you’re looking for a track at the last second. To do this, disconnect your DJ controller to activate its offline player screen, and then click the “Analyze Files” button at the top of the browser window, making sure that the “Set Beat Grid” and “Set Auto BPM” options are ticked. Let’s play some tunes! 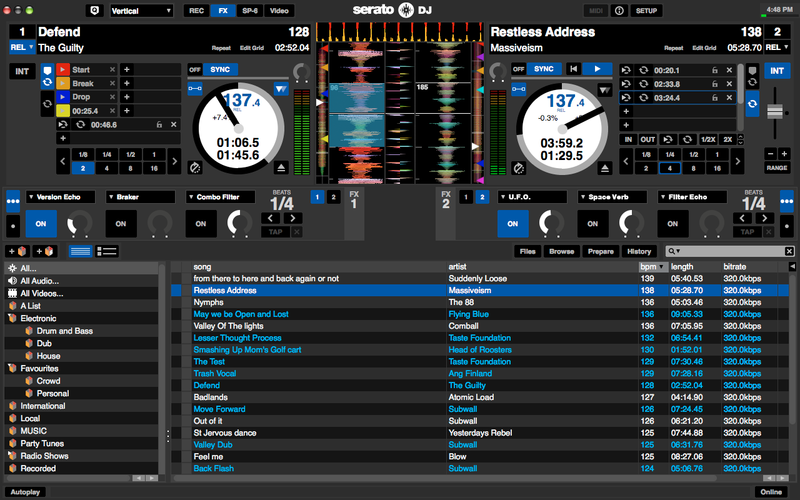 Drag a song from the browser window onto the left virtual deck of Serato DJ. You’ll see the song’s name appear on the deck, and you’ll see a waveform appear in the middle of the screen. Move your controller’s crossfader to the left, make sure the volume fader is all the way up, and hit the play button on your controller. You should be hearing the song playing back through your speakers. Do the same thing for the right deck: Drag a song from your browser onto it to load. With the left deck playing, move the crossfader all the way to the right; notice how the volume of the song that’s currently playing begins to dip until it’s silent. With your right volume fader all the way up, hit the play button on the right deck of your controller. You’re now playing the song that you’ve loaded onto the right virtual deck after you faded out from the song on the left: In other words, you’ve just executed your first mix! While you can’t change Serato DJ’s skin, you can change the orientation of the waveforms as well as the way they’re presented. Serato is famous for its “stacked waveforms”, letting DJs get a look at how one song’s waveform looks alongside another, which is a huge advantage for digital DJs when they mix as it’s possible to see if both songs (or four of them, if you’re using a four-deck controller) are “on time” and in sync. You can change the orientation of the waveforms as well as the information displayed by Serato DJ by choosing from any of the four interface options available. To do this, just click on the button on the upper left drop-down menu (it’s set to Vertical by default), and take a look at the other display options. 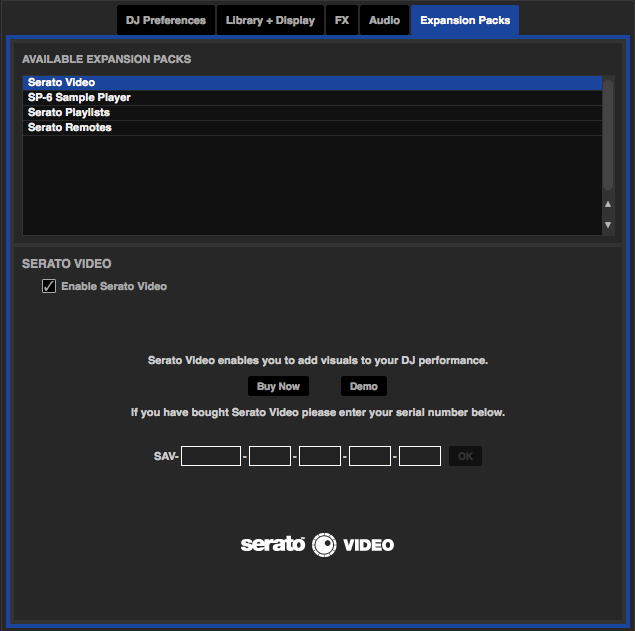 The latest version of Serato DJ comes with a demo of Serato Video; all you have to do is enable it in the Setup menu. Now that we have Serato Video enabled, let’s try adding some visuals to our music! Your visuals move in time to the beat! We did a lot of work on your first day with Serato DJ, so give yourself a pat on the back. 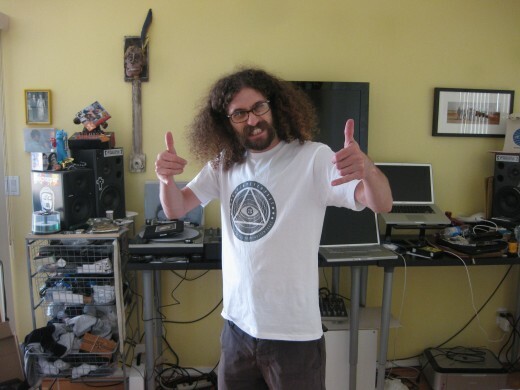 Even The Gaslamp Killer approves! Goodness, that was a lot covered for our first day with Serato! By now you have Serato DJ installed on your computer, and you have it playing nicely with your DJ controller. You also have your music and iTunes library accessible from within Serato DJ, and you’ve even had a taste of what it’s like to DJ with visual support thanks to the demo version of Serato Video, so go ahead and start DJing! If you’re a DJ who’s just starting out, why don’t you check out our How To Succeed At DJing series? It’s part of our free training programme, and one you should definitely check out if you want to maximise your chances of DJ success. We also have a series of training articles about getting started with VJing, so check that one out as well. What challenges did you struggle with when setting up Serato DJ for the first time? We’d like to know if we missed anything, so go ahead and let us know in the comments below. I spent the first day trying to figure what they had done to the mapping for the Novation Twitch after they had stopped supporting Itch. I still like Serato DJ… but I’ve definitely thought about buying a new 4 deck controller. After the addition of Flip in DJ 1.7 I believe that I’ll wait a while until the start making new controllers obsolete a few months after you buy them. The main reason I use Traktor Pro with the Novation Twitch (90% of the time) is because Serato would not give me the option to do “4 deck mode.” These are decks I use for my Microphone and Drum Machine in. Sadly, HID mode is not native in Traktor. “Remove my options and I’ll remove you as an option” is one of my general rules. @ran me too. It’s not that it’s got any worse but I ain’t got better. Couple with remote to get some sensible handle on FX. Reloop Terminal Mix 8 is calling me…. This is great info, as I still currently use Serato Scratch Live. I’ll hold off as much as I can until I really need a new controller. Hi has anyone else had problems with the beat grids not setting properly? After analysing the tracks they seem to be ok at the beginning but are off towards the end. I didn’t have this problem in traktor pro so wondering if there are any tips to get around it? How can you put pictures or my logo images in serato dj video while I’m not playing videos?? Does anybody know how to do this ..
Serato really does make the life of a DJ so much more simple. 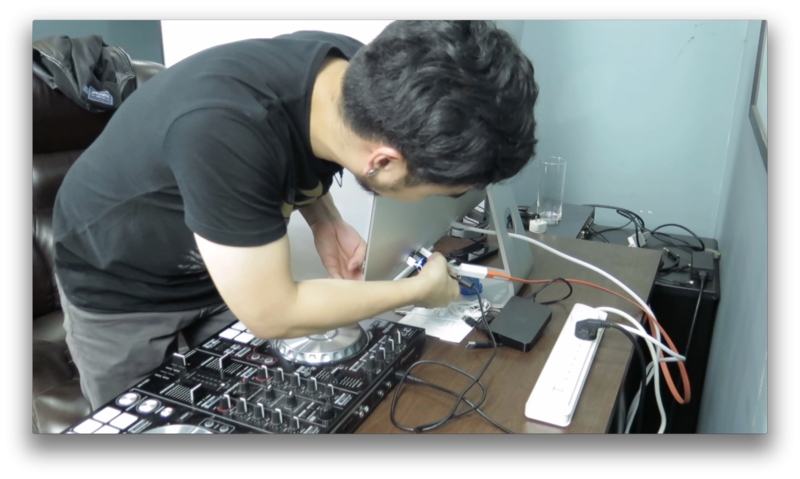 At the end of this very help video, Joey Santos stated that that Digital DJ Tips has a full Serato training. Where can I find Serato training for beginners? Can I use a surface pro 3 to run serato dj intro with a numark mixtrack pro 2 ?